"I'm in! I hope you guys have fun...I'm so jealous! Rubes is a bit too young, otherwise I might've gone. But that's only because I love the show so much. Heh." Thanks for entering! Today, I was surprised to get a message that school (work) is canceled. Everyone has been talking about this possibility for days, but I really didn't think it would happen. There was only about an inch of snow at my house, but apparently the roads were quite icy. So, instead of getting up early, dressing up for parent conferences, and commuting to work, I got to head back to bed for an extra two hours! This was just the break I needed -- a day at home with Stella to clean up before Thanksgiving and get a few projects done. Repaired two pairs of Sweet Pea's wool longies that had small seam holes from lots of wear last winter. You can see in the above photo that the sheets are stripped off of Sweet Pea's bed. That's another thing I did today: changed and washed all our sheets. We also raked the leaves in the front (photo of Sweet Pea from last week) and used the leaves to put the raised beds to sleep for the winter. and ate half a batch of brownies. In addition, we took a nice walk to the park with Glen, and played on the swings, but I didn't take any photos. Left on my list to do: repair two pair of my work pants, make the dough for our Thanksgiving rolls, iron the napkins, and help Average make the pies and appetizers tonight. Whew, it sounds like a lot when I list it out but the day has actually been pretty relaxed so far. Sweet Pea is napping on the couch and I'm watching Ellen as I type (a little teary at the couple she just reunited). It's uncertain whether there will be work tomorrow, but even if there is it is only 8 to 12 and then back home to get ready for our overnight company (two sisters-in-law and their families). I LOOOVE Thanksgiving but I'm a little nervous about hosting it at our house, trying to get all the food ready and everyone comfortable and the house fairly clean. And we are running a 5k race in the morning, so it will be a full day! I'm sure everything will work out, right? 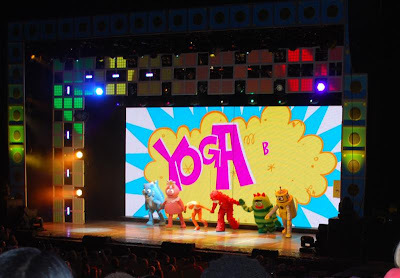 Review: Yo Gabba Gabba! Live! There's a Party in My City! Attending a live show is always a treat. 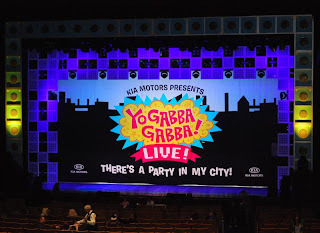 The Yo Gabba Gabba! Live! There's a Party in My City! show last Monday was no exception. We arrived only about ten minutes early, and it felt a little weird to walk into a venue where I normally attend serious plays and musical performances, full of children, toddlers, and babies, many in costume. I had been to see The Color Purple there two days before, and it was quite a different atmosphere! 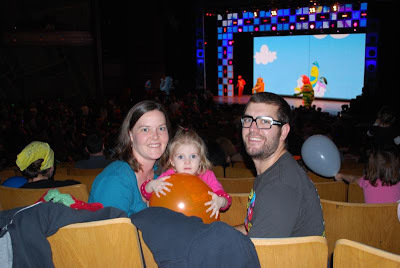 Unsure how Sweet Pea would react to the show before we went, I was a bit overwhelmed at first and so was she, but after the first few acts she settled in to enjoy it and danced along to the music at times. Overall, it was a fun experience for us all and a happy memory to look back on as our first live performance as a family. The show producers, or planners, or whatever they are, included a few extras for the audience that really added to the experience for the kids. There was confetti that shot out over the crowd, a huge balloon drop, and free paper glasses styled after DJ Lance's. 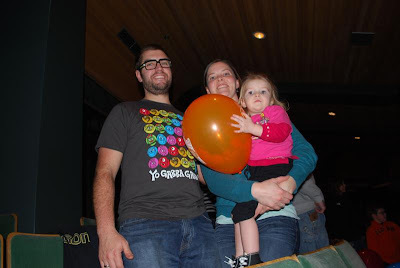 Getting a balloon was definitely a highlight for Sweet Pea and she looked through it and waved it around for the remainder of the show. Black, Mos Def, The Roots, Sal Masekela, and The Shins. The guests for the live show in Eugene were: Keller Williams with a sweet song about hula hooping, someone named Sunshine for a "dancey dance" number, and Biz Markie with "Biz's Beats." Keller Williams was awesome -- I would have paid to see him alone. Sunshine was a little off, but her dance was still fun. Biz's talents would be impressive no matter the setting, and it was really cute the way that he went into the audience and interacted with the kids, although he seemed a little wiped out by the end. I like that they have surprise guests for each location. The performers engaged the audience and had us standing up, sitting down, calling things out, dancing, and then timed an intermission perfectly for a diaper change for Sweet Pea. The pacing was good for our nearly-two-year-old, but I know some families did go home early due to tired or overwhelmed kids. The volume of the performance was pretty high, too loud for some kids, and the flashing lights of the stage were a little uncomfortable at times. My only other complaint would be the over-prevalence of the sponsor. One of the best parts of attending public events is meeting other families. We were lucky enough to sit behind a super nice woman who offered to take pictures when our camera battery died before the show even began. Thanks to Jenny for all of these photos! Well, the shirts are here, folks! 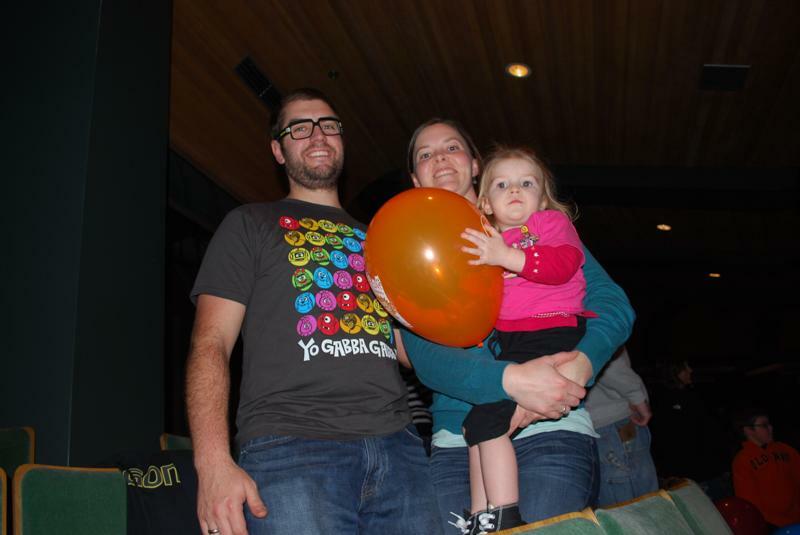 One lucky winner will have his or her choice of not one, but TWO Yo Gabba Gabba t-shirts! My family will be wearing our own on Monday, November 15 at the live show here in Eugene, Oregon. Look for a review of the show in the next week or so. To give away, I have either pink or grey in size kids 3, pink or grey in size kids 5/6, and grey adult XL. I will be posting this giveaway on my other, specific to Eugene, blog (go to www.eugeneactivefamily.com) as well, for the other THREE t-shirts. You may enter both, and up your chances. I will email the winner from each blog and the first to reply gets first choice on the colors and sizes. To enter here, just comment below with your email address! 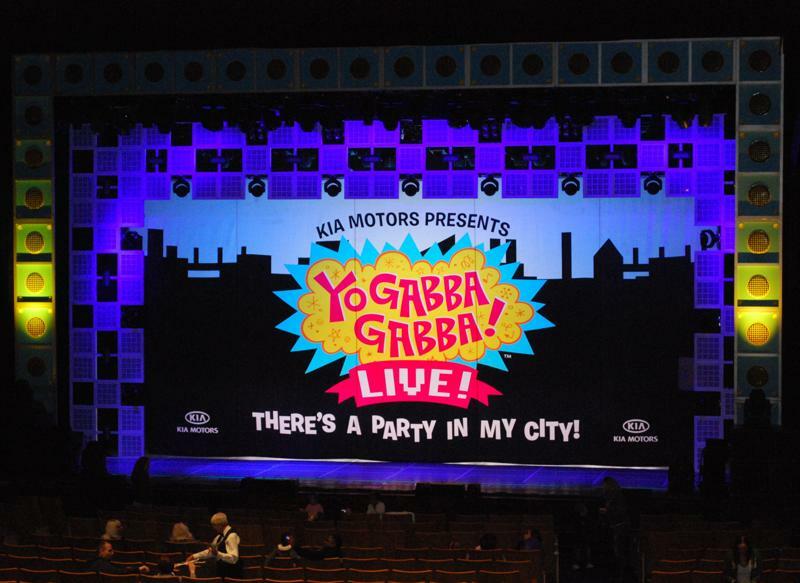 I was offered free tickets to a Yo Gabba Gabba show at the Hult Center here in Eugene, for next Monday, November 15. I wasn't sure about it at first. We don't have cable and Sweet Pea doesn't watch TV shows yet, so I checked out some YouTube videos and read about the show on a few sites. Sweet Pea really enjoyed the little clips we watched on the computer, and my husband, who loves kids shows for some reason, had seen it before thinks it's pretty good. A hipster friend at the bicycle shop originally showed it to him online. So, after my brief research I decided to go for it. I think it will be really fun! And we are getting t-shirts for a giveaway this week! I think I'm going to get the shirts tomorrow so I'll post the rules and photos of the shirts then. After the show, I'll be writing a review for you all to read. 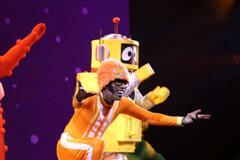 What I like about Yo Gabba Gabba so far is the emphasis on music. Looking forward to the show!